These could not be simpler and are almost too cute to eat! Happy Halloween! Grind Oreos to fine crumbs in a food processor. With an electric mixer (or just a spoon will work), combine oreos and softened cream cheese. Roll into 1 inch balls and place on a wax covered cookie sheet. Put in freezer for 15 minutes. Melt chocolate according to directions (about 30-45 seconds). Dip each truffle into the melted chocolate (I use a toothpick) and place onto wax paper to cool. 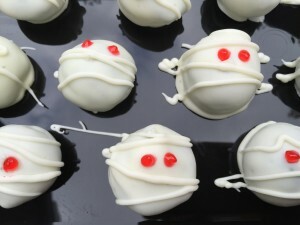 Drizzle with extra white chocolate (to make the mummy) and add red eyes using red gel food coloring. Refrigerate up to 3 days in a sealed container. Hint: to drizzle the melted white chocolate, add the melted chocolate to a ziploc bag and snip off the corner with scissors. Copyright © 2015 Our Everyday Dinners - This is an easy recipe for how to make Oreo Mummies.